The larger band takes a turn at 12 original compositions from its touring repertoire. More instrumental pieces than previous recordings. Styles of songs range from jazz, rock, folk, and a variety of rich spiritual and dance tunes. Two of the tracks are from outstanding recordings of live performances at the Sunken Garden Annual Poetry Festival in West Hartford, CT in 2000. "Delta Lullaby", "Huehuetengo", "Todo Lo Bueno Se Acaba", "Batucada", "Looking For Buscando", "African Fete", "Faceless Waltz", "La Iguana", "Coyote Jump", "Bella Viola", "Atlantis". 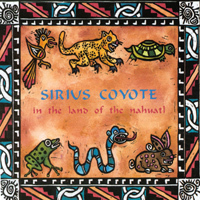 Sirius Coyote's first CD release. A compilation of re-recorded material from their previous cassette releases plus new compositions from their performing repertoire. Combination of tradirional styles and tunes based on the sounds of ancient American instruments. 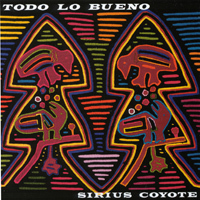 This record is a manifestation of the fusion of sounds from different cultures of the Americas resulting in an exciting and unique musical form. A musical journey through original, ceremonial, popular dance tunes and revolutionary songs of Latin America. "Azteca", "A Walk in the Rainforest", "Capoeira Samba", "La Selva Se Va", "African Marketplace", "Levantate", "Witzne Suite", "Witzne: Looking Back", "Obalube", "Cumbia de la Sierra", "We Need a revolution"
Children tunes from Latin American. First production to come out of Dennis' new 16 track in-house recording studio. Mostly songs and game-songs that Giovanni grew up with in Venezuela. All of them previously unreleased by the coyotes. It is illustrated with children’s art-work cut and pasted from the many letters receive from their school programs. Liner notes include all lyrics in Spanish with English translations. "Tipi tipi tin", "Las Hormiguitas", "Chocolate", "Dos y Dos", "Marcha de las Vocales", "Los Continentes", "Ambos a Dos", "El Reino del Reves", "Duerme Negrito", "Sana Sana", "Los Cuatro Elementos", "Paz", "A Walk in the Rainforest", "Si Somos Americanos", "Corn, Beans and Chili Peppers", "Zum Zum"
Running time: Cassette 38 minutes: ends with "Paz"
CD 58 minutes: four extra pieces. 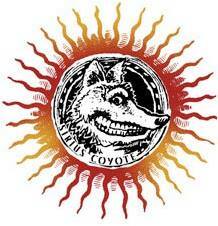 BOOKS BY MEMBERS OF SIRIUS COYOTE "Open Ears: musical adventures for a new generation" Edited by Sara deBeer with chapters by Phoebe Snow, Pete Seger, Mickey Hart, Paul McCartney, Shari Lewis, Giovanni Ciarlo and others. Published by Sterling Publishing Co., Inc. New York, NY 1999. Add $1.50 per item for shipping and handling and 6% CT sales taxes.